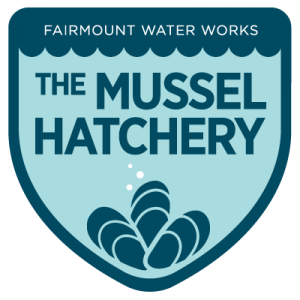 Press & Awards – Hanson General Contracting, Inc.
Stephan Salisbury shares his thoughts on the grand opening of the Mussel Hatchery at the Fairmount Water Works that was recently renovated by Hanson Services. 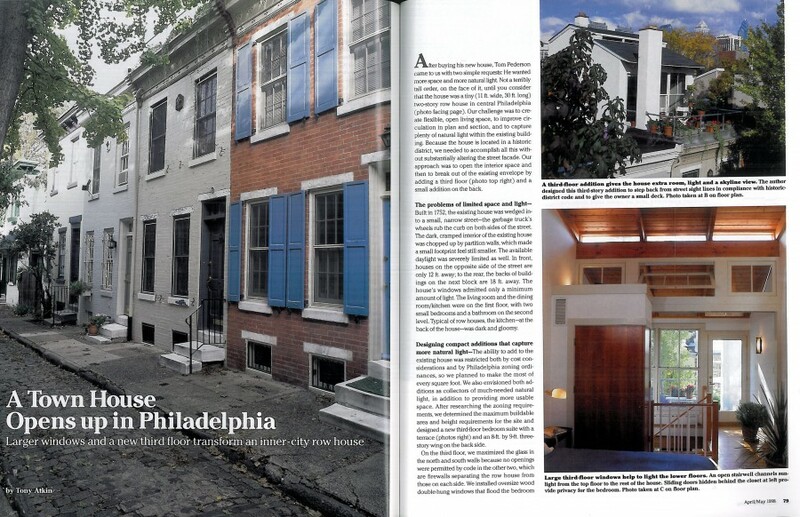 Sally Downey interviews Alice Hall about her trinity rowhome in Center City, renovated by Hanson Fine Building. Our West Philadelphia Kitchen Bay project, in collaboration with Rasmussen/Su, was featured in an article about bay window breakfast nooks. Our Wyndmoor Residence bath, in collaboration with architects Rasmussen/Su, was featured for Budget-Smart Bath Updates. 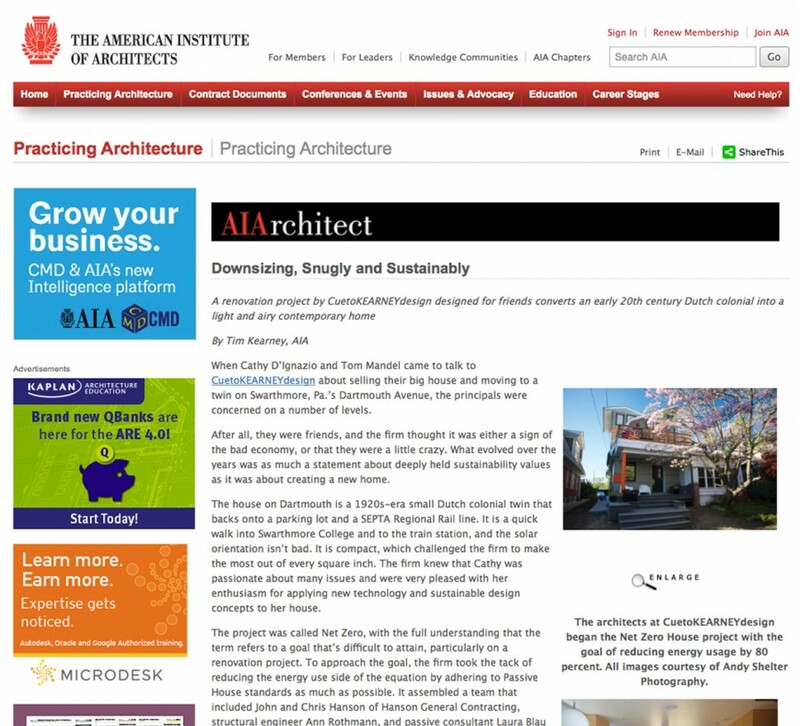 Our Passive House retrofit of a 1920s colonial in Swarthmore, in collaboration with CuetoKEARNEY design, was featured in AIArchitect online. 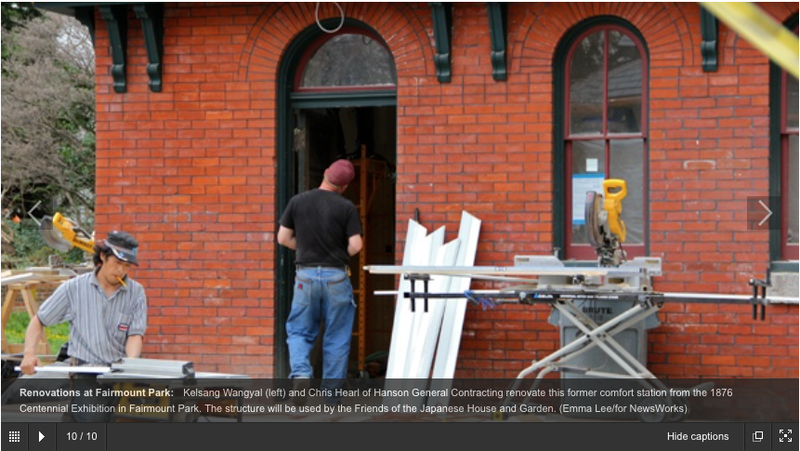 "From Comfort Station to Exhibit Space in Fairmount Park," an article on newsworks.org about our restoration project on the 1876 Centennial Exhibition comfort stations. 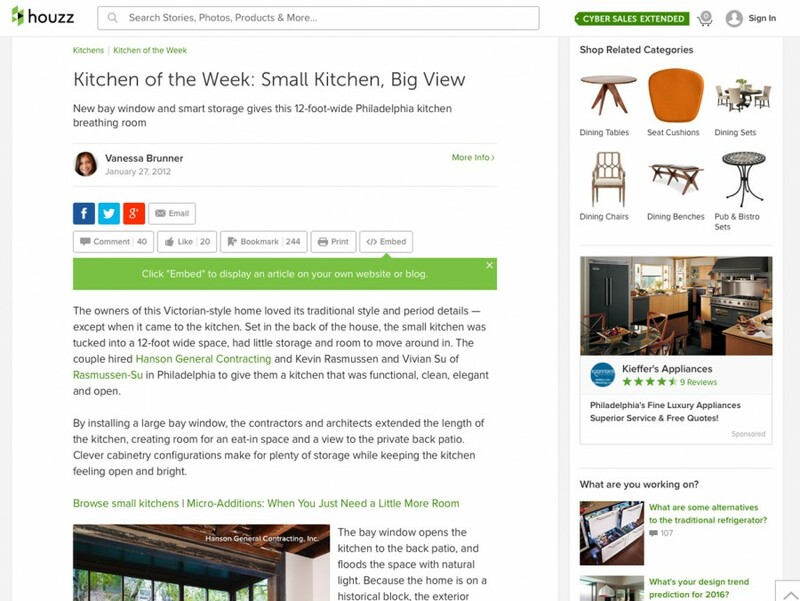 Our West Philadelphia kitchen project, in collaboration with architects Rasmussen/Su, is the featured Kitchen of the Week on houzz.com. 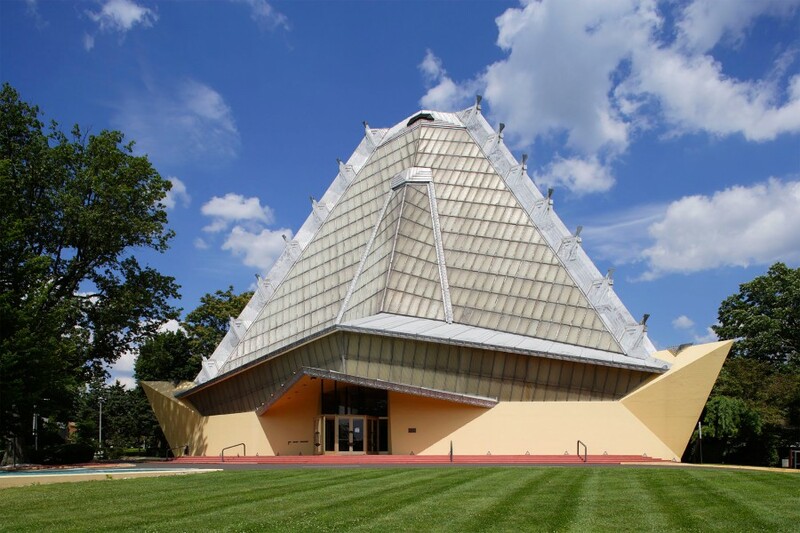 We completed a permanent exhibit project at the Beth Sholom Synagogue in Elkins park designed by Frank Lloyd Wright, which was originally opened for worship shortly after Wright's death in 1959. 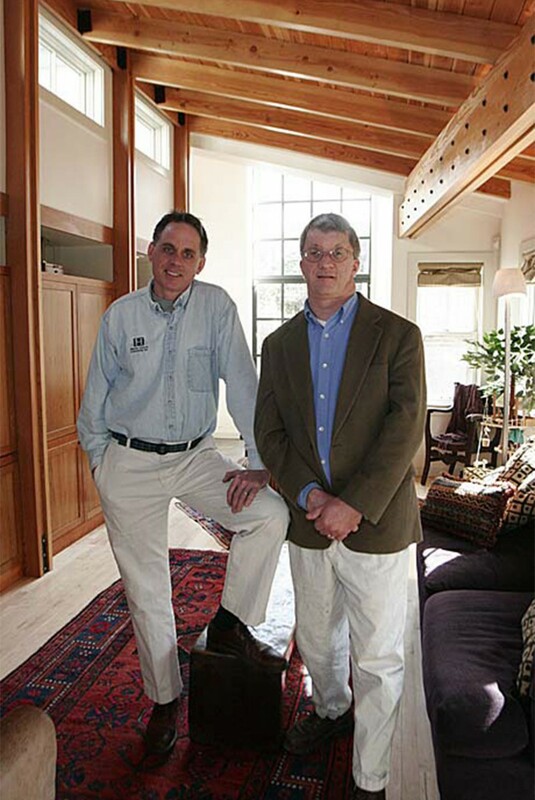 "The Farmhouse Renovation - A Survivor's Tale" by John Hanson '78 and Morgan Hanson '03. 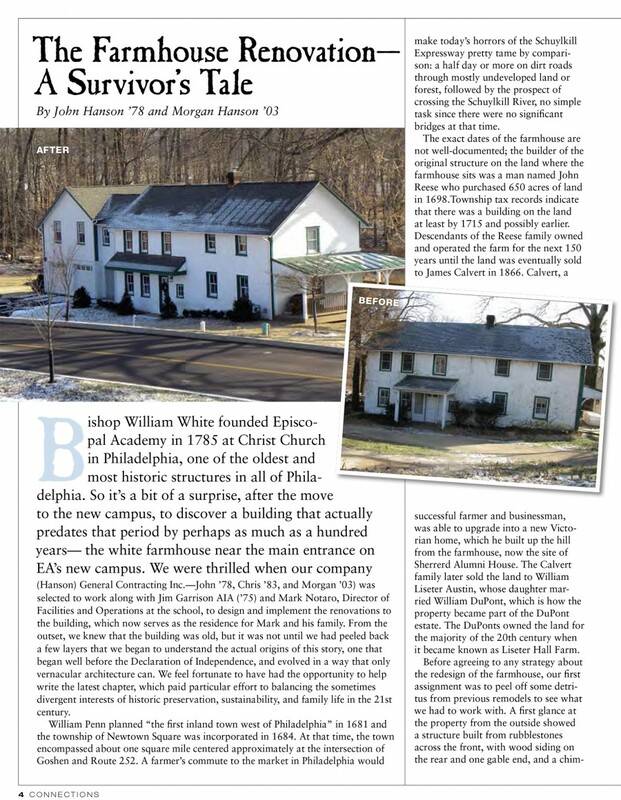 The University of Pennsylvania Alumni Magazine recently featured a short article about our project at Andalusia, and all of the alumni connections among the participants. Hanson was featured in an article in Remodeling Magazine, which surveyed businesses around the country about the practice of profit-sharing to improve company performance. 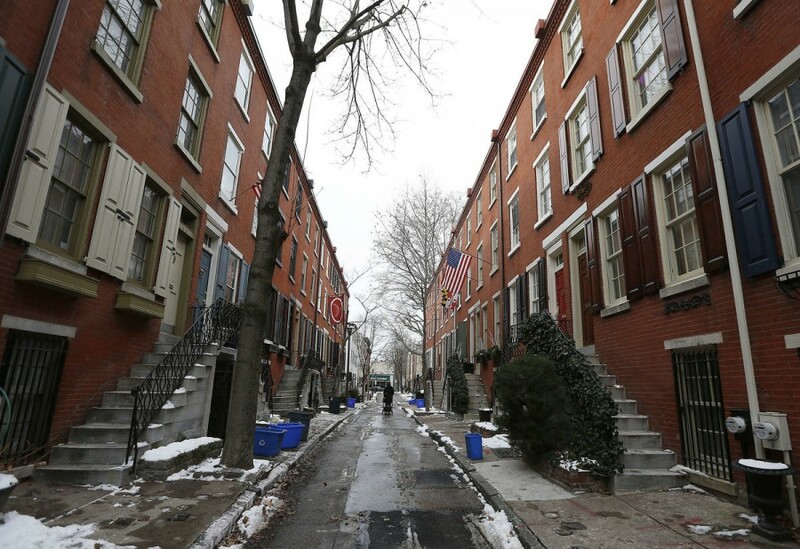 Philadelphia row house owners who feel cramped and in need of more space typically add on to the back of their dwellings. But Spring Garden residents Craig Smith and Michele Frank did something rarely seen in the realm of row house additions: They expanded sideways. 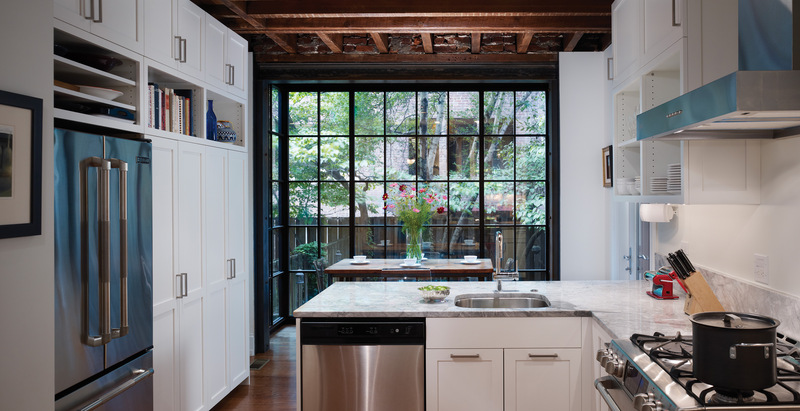 By bumping out 3 1/2 feet into the side alley that separates the rear section of their home from that of their neighbors’, the couple transformed their narrow first floor into a bright and spacious domain with front-to-back views and the modern kitchen of their dreams. Though the couple gained just 100 square feet, this was one bold and complicated project, involving the calculations of a structural engineer, the installation of massive steel beams, and the buy-in of the couple next door. Only that last part was easy. In fact, it was neighbors Anne Cook and Russ Troyer who had originally brought up the idea, years earlier, of transforming the sliver of side yard between their houses, used by most rowhouse dwellers for trash cans and central air-conditioning units, into living space. But it wasn’t until Frank, a former college English instructor, and Smith, an executive recruiter and consultant, had their second child that their home began to feel like a tight fit. Not only was the house unusually narrow, a previous owner’s renovation that had opened up the first floor featured a strange kitchen layout that stretched from one end of the house to the other. While searching for a new house, though, they realized there was much they liked about where they lived. They decided to approach Cook and Troyer about the addition scheme. “I’ve been wanting to do this for 25 years” says Cook, who quickly agreed to a joint construction project that would create additions for both families. Each couple worked with separate architects, but one construction firm, Hanson General Contracting, did the building, and one structural engineer, Skip Popoli, devised the system of steel beams and posts crucial to holding up the houses once the original sections of first-floor exterior wall were removed. “There were some scary moments” John Hanson says of the project, which required a zoning variance. Chief among them: removing the enormous expanse of original brick wall after the beams were put in place. “You try to do it systematically, but once it’s free-standing, there is a chance for that wall just to fall over” he says. With no rear access to the houses, a team of workers had to carry all the support posts and beams in through the front doors. The dirt from excavating the new foundations also had to be carried out through the front doors in buckets and wheelbarrows. Cook and Troyer have not yet finished their interior work. 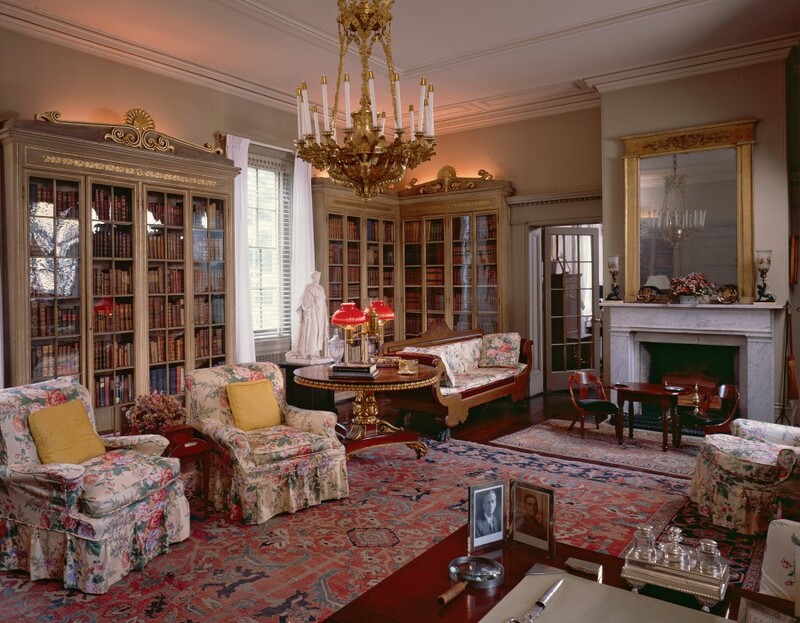 Smith and Frank moved back into their house in November, after a total renovation of the first floor that took six months. In the end, construction of the two copper-roofed, skylighted additions, not including any internal finish work, totaled more than $90,000, split by the two couples. A considerable expense, but one that bought a big impact, Rasmussen says. 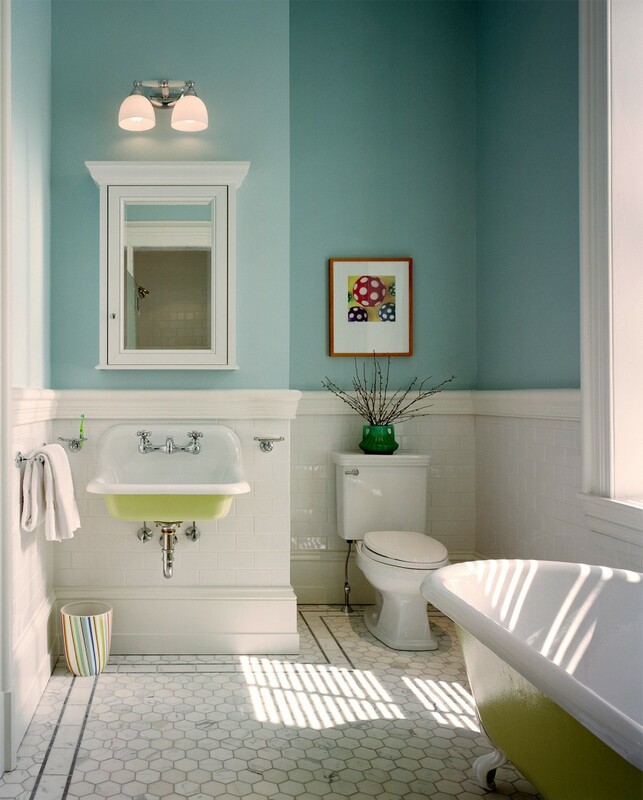 Besides more space and light (from those skylights and a new window on the end wall of the addition), the couple got the powder room and coatroom they had always wanted. 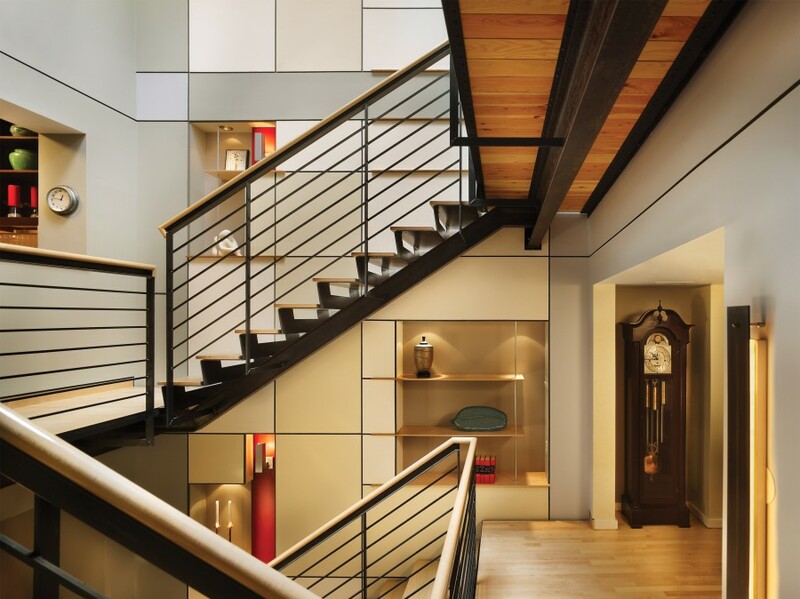 The project also created an open staircase to a new basement playroom for the couple’s children, ages 5 and 19 months. “We really wanted to get the television and all the toys out of the living room” Frank says. Also gained in the renovation: a well-defined gracious dining room and a comfortable living room that looks out into the garden. But what Frank really loves about the change is the expansive new kitchen, with its Shaker-style maple cabinets, black-granite-topped island and breakfast bar, and six-burner Wolf range. 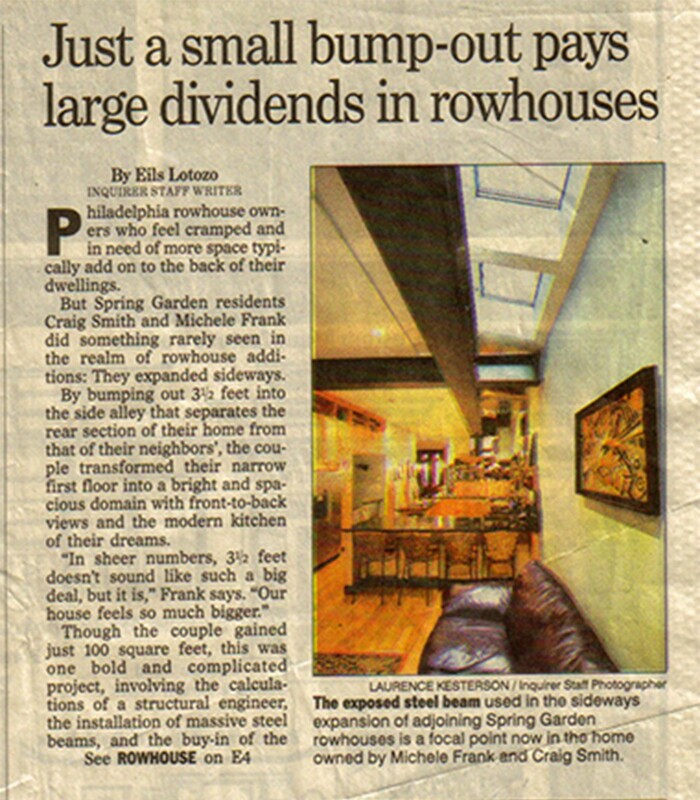 OUr Fitler Square Renovation was the subject of a feature article "A Town House Opens up in Philadelphia" by Tony Atkins. 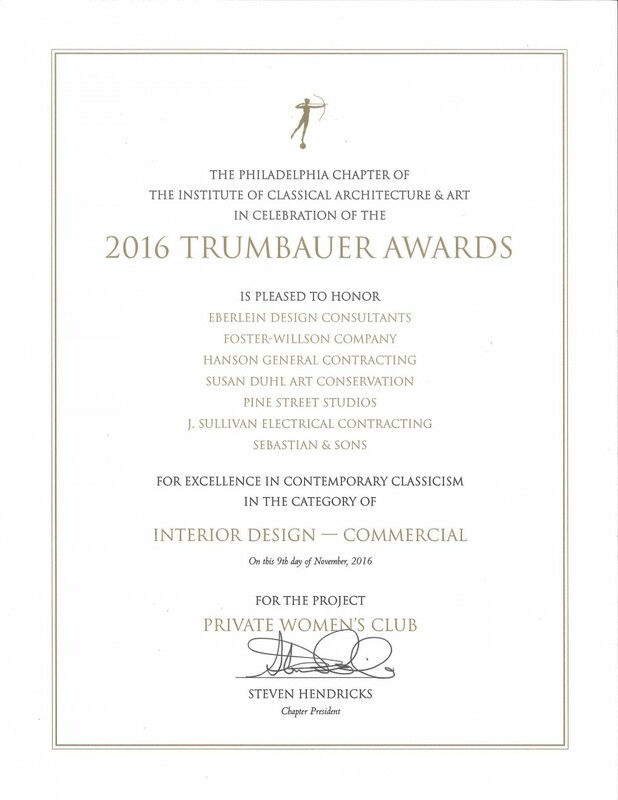 Our project for interior remodeling at The Acorn Club won the 2016 Trumbauer Award for Excellence in Contemporary Classicism in the category of Commercial Interior Design. 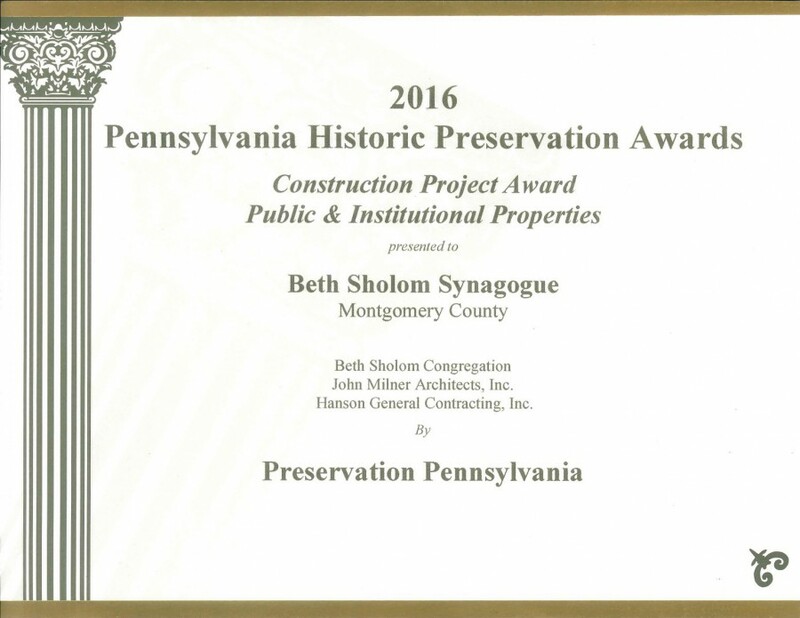 Our project for accessibility modifications to Beth Sholom Synagogue with John Milner Architects was given the 2016 Pennsylvania Historic Preservation Construction Project Award for Public and Institutional Properties. 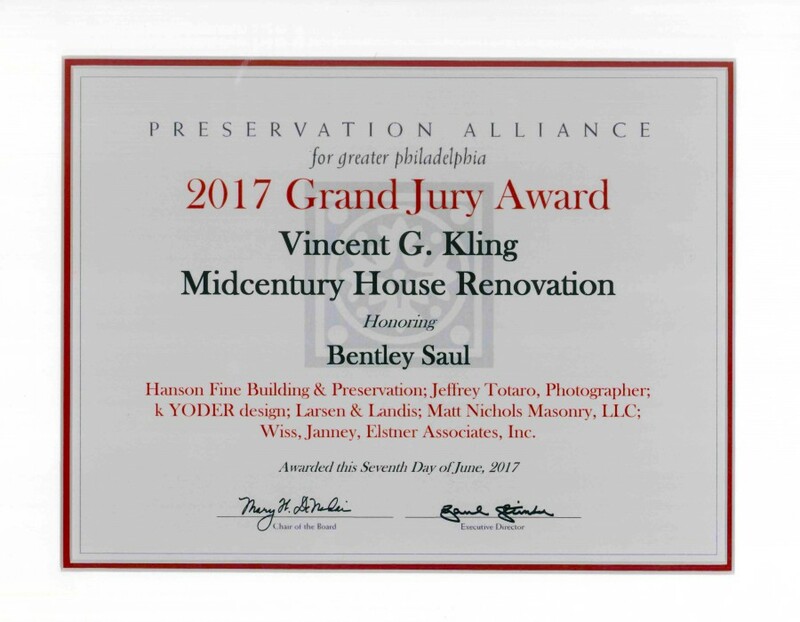 Our projects for accessibility modifications to Beth Sholom Synagogue with John Milner Architects and restoration and addition to the Vesper Boat Club with A K Architecture were both given 2016 Philadelphia Preservation Alliance Grand Jury Achievement Awards. 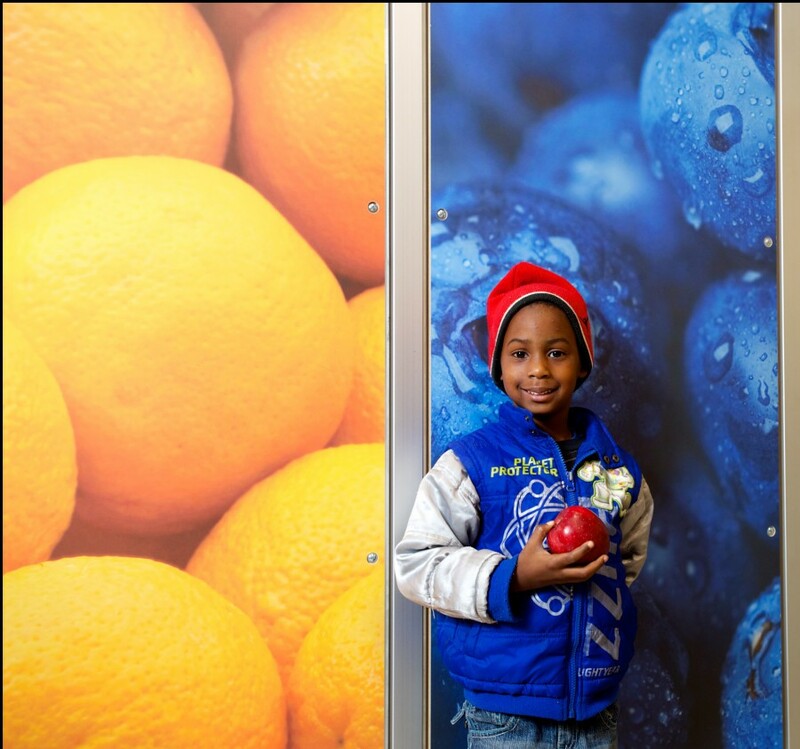 Our project with Strada Architects and the Food Trust won a Willard G. Rouse Award for Excellence for a group of five Corner Store conversions, which involved creating fresh food opportunities in urban food deserts. Our project with John Milner Architects at the Sakura Centennial Pavilions was given a 2013 Philadelphia Preservation Alliance Grand Jury Achievement Award. Our Windsor Residence bath, in collaboration with architects Rasmussen/Su, is a winner in the Design category for the 2013 "Best of Houzz" baths on houzz.com. 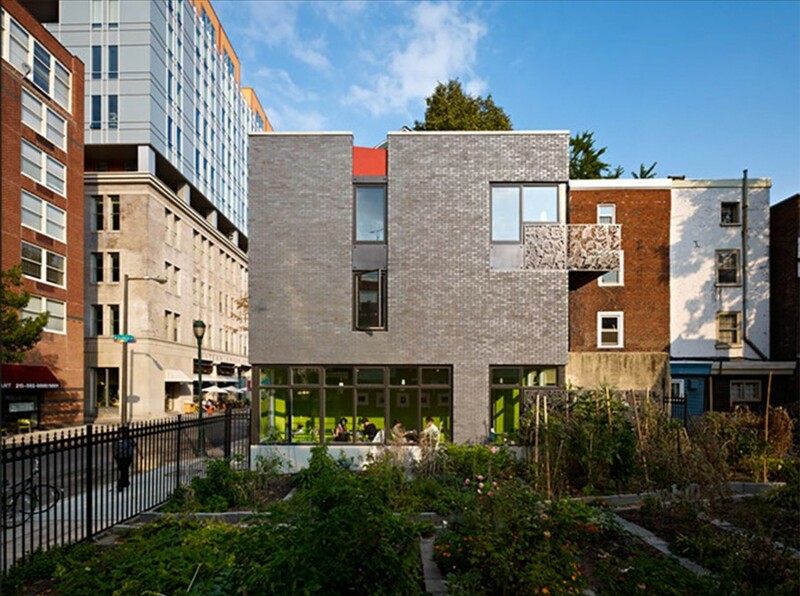 Our project with Rasmussen-Su Architects at 1112 Locust St. in Philadelphia has been awarded a 2011 Award in Design Excellence from AIA Philadelphia. Our project with Ewing Cole Architects at the Rush Estate at Greenwood Cemetery was given a 2011 Philadelphia Preservation Alliance Grand Jury Achievement Award. Our project with Rasmussen-Su Architects at 1112 Locust St. in Philadelphia has been awarded a 2011 Grand Jury Award from Residential Architect Magazine for Light Commercial Construction. Our project at the Knights of Pythias Greenwood Cemetery recently won an Industry Award from the American Cultural Resources Association for preservation of cultural and historical community resources. 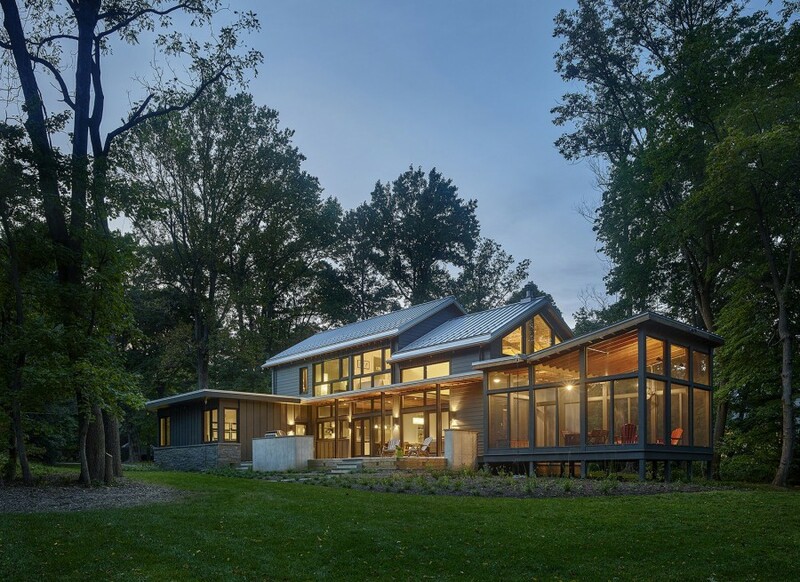 Our project at the Thompson Residence with Peter Bloomfield and Associates Architects (Queen Village Home in our portfolio) was recognized with a State of PA Citation of Merit Award from the American Institute of Architects. 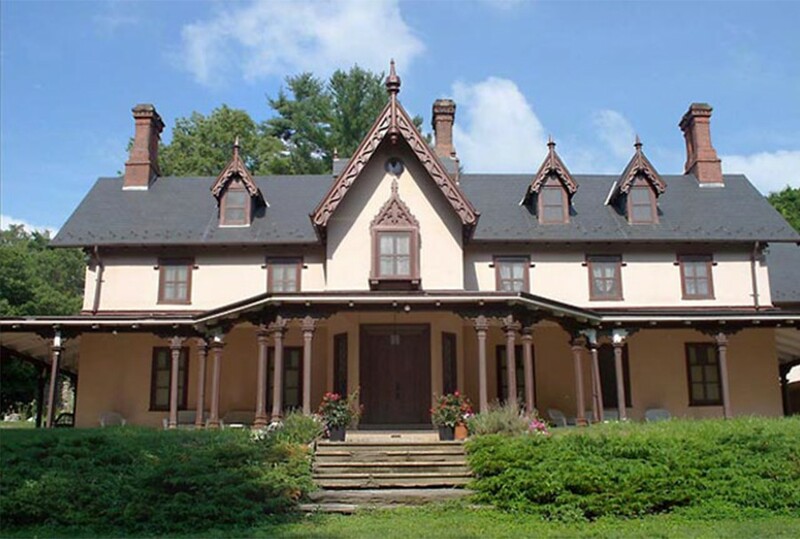 A project we recently completed at the Haverford Grange in collaboration with John Milner Architects won an award for Site Preservation for its sensitive restoration of the mansion’s front porch, windows, dormers and cornices. 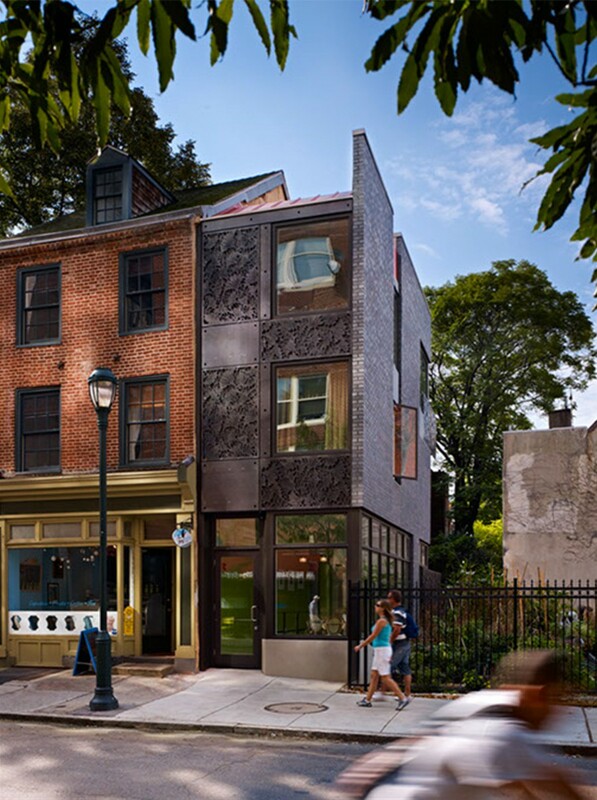 A project we completed in Society Hill in collaboration with the owners and John Milner Architects won an Award of Recognition for its sensitive efforts to integrate two small 18th century row houses into one larger single family residence. Hanson General Contracting Inc. has been selected by Remodeling magazine as a winner of the 2006 Big50 Award in the Sales and Marketing category. The Big50 awards were presented at a gala dinner at the Remodeling Leadership Conference in Washington, D.C. on May 19, 2006. Winning companies are featured in the May issue of Remodeling magazine. Each year, Remodeling magazine inducts 50 companies who have set the standard for professionalism and integrity through smart marketing, exemplary business practices, unique design, and extraordinary impact in their community or the industry at large. Big50 remodelers run successful, often growing, companies of various sizes that have taken the lead in raising industry standards. Remodeling editors, columnists, industry leaders, and the companies themselves make the nominations each year. Following a lengthy evaluation process which includes interviewing people at the nominated companies, and often interviewing their competitors, suppliers, and subcontractors, Remodeling’s editors select the 50 remodelers who exemplify the very best of the industry that year, and who have something to offer other remodelers in proven practices. Winners are selected in these categories: business savvy, fine design, industry impact, market wise, movers & shakers, niches, sales & marketing, and teamwork. 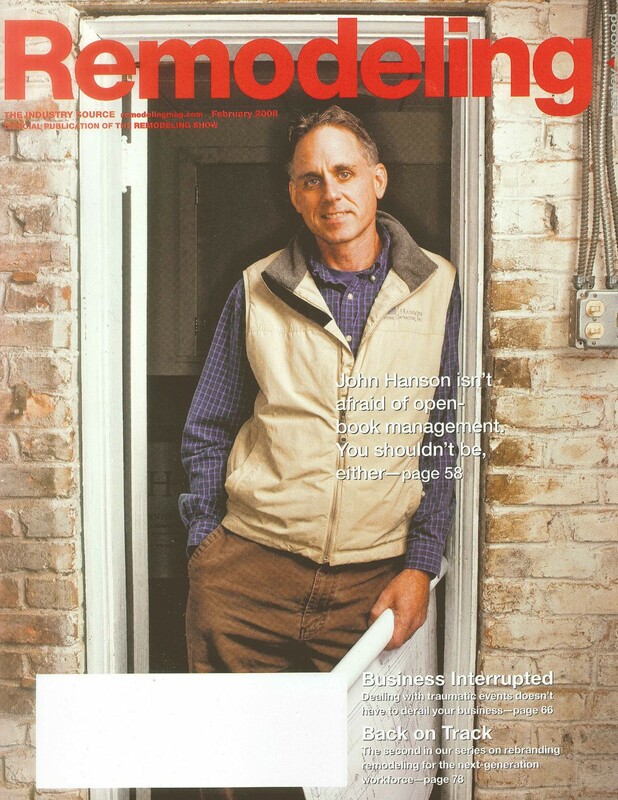 Remodeling magazine, published by Hanley Wood, LLC, is the leading publication in the home improvement industry. Designed to address the specific concerns of residential remodeling pros, the magazine is both a business tool and an industry leader for a market that is projected to top $290 billion in 2006.